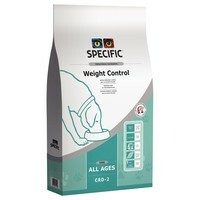 Specific Weight Control CRD-2 Dry Food for Adult Dogs is a complete and balanced dietetic pet food to help maintain your dog at a healthy body weight after an initial weight loss programme. Made with a low fat recipe that contains slightly raised fibre and protein content, the diet can be fed in full portions that will leave your dog feeling full, but still help them to keep off the extra weight. Specific Weight Control also contains additional L-Carnitine which helps to move fatty acids into your dogs’ cells to be burned for energy; meaning the weight loss comes from fat rather than lean body mass.